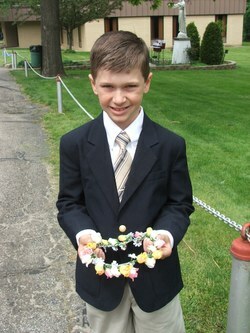 Christopher makes his confirmation this coming spring. He's chosen his brother, Ben, to be his sponsor. There was a saint pagaent recently where each of the candidates for confirmation were to dress as their patron saint. Chris chose St. John Bosco as his patron which has always been his favorite saint for a number of reasons including Don Bosco's love of juggling and magic tricks. Blurry iPhone snapshots but you get the gist. Borrowed cassock and homemade biretta made from this pattern. It is made from cardboard and spraypainted black. "Do not open your heart to everyone, but only to one who is wise, God-fearing, and who can keep your confidence...do not flatter the rich, or seek to be in the presence of the great without good reason. Rather associate yourself with those who are humble and have simplicity, who are devout and self-disciplined, talking with them about those things that will edify and strengthen the soul...Have charity for all but familiarity is unwise. Sometimes it happens that we know a person only by his fame, but when we meet him we are often disappointed. And sometimes we think we please others by our presence, when in reality, they come to dislike us because of the faults they see in us." There is so much wisdom in The Imitation of Christ. If you haven't read it yet, you might like to pick up a copy at the library. We have had a very rough year, perhaps it has been two. There have been many heavy and serious issues that our family has encountered in this time, none of which I have shared on my blog because they are personal. I believe in being genuine here on A Gypsy Caravan but I do not believe in being transparent. There is no falsehood to be found here, no trying to appear to be something we aren't but there has been a deliberate omission of the issues with which we are dealing and the sufferings that we are bearing. That omission stems from my belief in the privacy of the family and is good common sense, in my opinion. I have close friends who pray for our situation and I humbly ask you to do the same. To those of you who are also bearing heavy crosses, I wanted to share the things that have helped us through the hard times and sufferings. These are the three things that have helped me to endure many a hardship. Prayer can be short aspirations if need be. "My Jesus Mercy" or "For you, dear God." is sometimes all that I can muster. Sometimes a stressful life situation does not allow for hours of prayer but if we are trying to please Him throughout the day by offering Him our small gifts of love, it will help unite our heart to His. Also, if I remember to offer up our suffering to God each day, hardship becomes much easier to bear because I understand that it has a purpose, that it is not all for naught. I try to encourage my children to offer up small annoyances or discomfort for the Holy Souls in Purgatory. Sometimes the children roll their eyes and find it annoying. Other times, though, it sinks in. For example, when Christopher broke his arm a couple weeks back, he suffered greatly. The ride to the hospital brought him severe pain as his arm was hanging from the point of the break in a contorted manner. Each small bump or turn caused him to cry out in pain. He sat through traction and manipulation. He saw his entire summer go up in smoke. I gently reminded him that I was so sorry he was suffering but that he could do well to offer up his horrible pain for some poor soul that had no one to remember it. He did so and still mentions that he believes he helped someone that day. Physical pain is easy to spot but much of our pain is from within: fear, being misunderstood or feeling unloved. These feelings are real and unite us with our Savior. They too can be offered up and may well be worth more than any physical suffering we may encounter. It is important during times of stress to "keep on keeping on", to work on my vocation with fervor. My vocation is that of a wife and mother. I certainly struggle to do a good job in this area but I will keep on trying. Sometimes I am selfish and do not do the best I can but one cannot give up and become discouraged. Once, I was speaking to the parents of seven whose children were grown. We were talking about how difficult it can be to raise many children and to do a good job. I mentioned my consistent problem with impatience. "I just can't seem to make it through a day without losing my temper. I am so impatient and ruin the day. " "No," the husband said, "you did not ruin the day, you ruined that moment. From that point on, practice being patient. Don't give up and label yourself or you will begin to become whatever negative label you give yourself. Apologize and keep trying." This was a good reminder to me that no one is perfect and that we should not pretend to be, though we must continually strive to do the best we can with the vocation we are entrusted. Lastly, trying to keep a positive attitude is something that comes from practice but has been helpful to me. I have memorized a number of quotes, some found below, and try to remind myself that someone, somewhere is suffering more than I am, that my difficulties are small compared to that which other people must bear. This attitude is not to be confused with the thought that is sometimes expressed by people who believe that they are especially blessed by God because they are exceedingly wealthy or because their baby was born without health problems or because the hurricane missed their home or any number of other things that the world thinks constitutes as favor from God. Blessings from God do not always come by way of lack of trials and a seemingly easy life. Sometimes God's blessings come from the stripping away of our pride, our attachment to material things, an illness or a by being misunderstood by others. Keeping our attitude in check and staying positive means eliminating sarcasm and a "martyred" attitude. Spending time with people who encourage us amidst our trials will help us to remain strong and positive. I once drove in a cab with a driver who explained his childhood, which to me sounded very difficult and impoverished. He came from an intact home with two parents but they were immigrants who struggled to keep their family fed and clothed. They did not rely on handouts and worked hard for everything they had. This cab driver told me that whenever he complained as a young boy, his mother always told him, "Don't complain. You are not a complainer." He felt that was the best gift she had given him, a mantra of sorts to remind himself not to complain. To this day, whenever he feels like being negative or complaining, he reminds himself that he is "not a complainer", closes his mouth and redirects his thought to something more positive. Thanks for visiting today. Have a wonderful summer evening with your family. We have had quite a lovely, though busy, past few weeks. 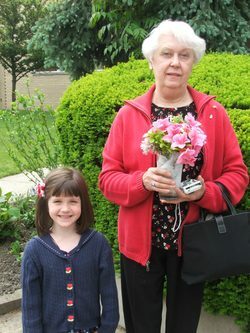 Our homeschooling group had its annual May Crowning late in the month. I have written about it in the past. 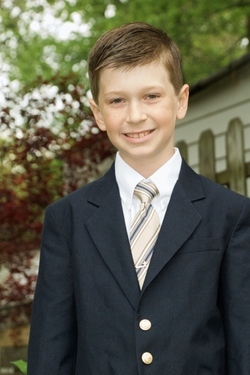 This year was quite special for our family as Christopher was a First Communicant and was able to wear his FHC clothing along with the other boys and girls who were receiving this year. 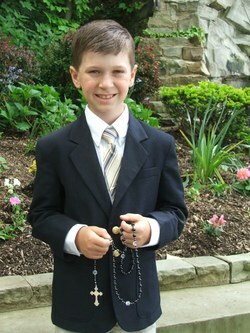 Here he is holding his new rosary made by Kimberlee. (Shameless plug: Kimberlee's work is absolutely gorgeous. You will not be disappointed by anything you order from her.) 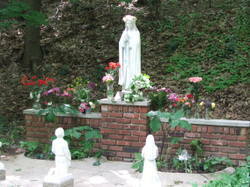 After Mass, we have a rosary procession to the statue of Our Lady which is up the hill, in the woods. 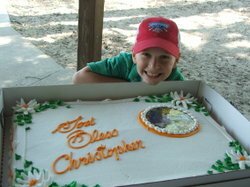 Christopher led the first decade for our group. It was just so very sweet. 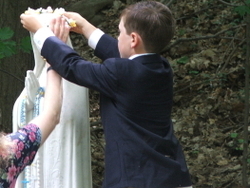 Every year one of the first communicants is chosen randomly to crown Our Lady. Chris had been hoping to be able to have the honor and he was delighted when he came up with the long straw. We have been working on his FHC notebook for several months, a page every so often. It was completed and we brought it to the party for his guests to see. I hope to post photos of it in the sidebar as soon as I get a chance. We are so proud of and happy for you, Christopher! 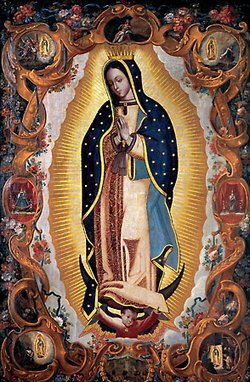 Here is a chronology of the events of Our Lady of Guadalupe as well as the relation of events as they happened. 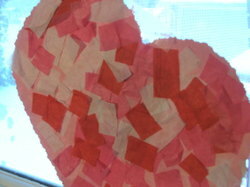 Have you read this beautiful idea from Kristen at Small Treasures? She recommends a small act of love and humility to overcome impatience with our children. Thank you, Kristen. Yup. 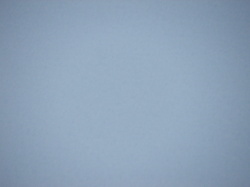 That's snow. Snow on the ground, snow on the windows, snow in the air. Though the outside is colorless, the inside of the house is full of color! 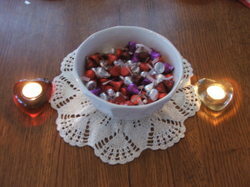 Here's hoping you all have a wonderful, chocolate filled Valentine's Day! St. John Bosco or Don Bosco, is hands down my favorite saint ever (next to the Blessed Virgin Mary of course). I am completely intrigued by this holy man, this man who remained fun and youthful at heart even until the day he died. Don Bosco was a friend to children and founded the Salesian order which has now spread throughout the world. He is the patron saint of boys, editors, students, school children, teachers and apprentices. John Bosco was born in 1815 in Turin, Italy, the home of last year's Winter Olympic games. His family was poor and lived a difficult life, made harder by the death of his father when John was only two years old. Margaret Bosco did her best to raise her three sons, work a farm and run a home. John helped on the farm and tended the animals. When John was nine years old, he had a dream in which boys were fighting. John stepped in and fought with them to try to get them to stop. A woman took him by the hand and the boys were changed to gentle lambs. She told him that this would be how he would help young people later in life. John decided that he would try to spread joy and happiness wherever he went, rather than fighting. He began to learn acrobatics, juggling and sleight of hand tricks to bring joy to those he knew. He put on shows for friends and townspeople, charging them the "price" of listening to the day's Gospel story. He loved to pray and began to go to school to learn to read and write. He had aspirations to become a priest but no money to pay for seminary. His brother became jealous of him so John left the farm. He lived with many different families until returning home at age fourteen. He went from house to house asking for money to put himself through seminary. He took on many jobs and learned several trades to help pay his way. He also saw the value of studying music, which he did in his spare time. In June of 1841, John was ordained a priest. 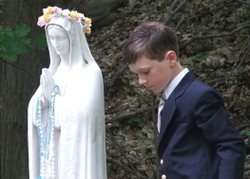 He told his mother that his first Mass would be to ask the Lord to make him "the friend and protector of young people. 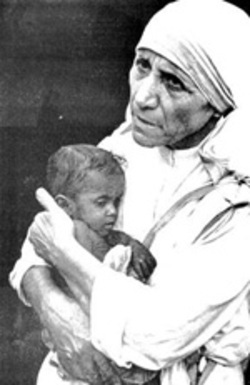 My only desire is to be the humble and joyful servant of all". Don Bosco met many young boys who were living on the streets in Turin. He wanted to help them by providing them with a place to live, an education and spiritual guidance. Slowly, a few, then twenty, then a hundred boys came to Don Bosco's house to have fun and learn about God. Don Bosco bought a home on a large piece of land and built a chapel there from an old shed. Workshops and dormitories were built as well. The boys learned trades such as sewing, carpentry, bookbinding and shoemaking to help them survive in the workplace and to give them a purpose and a future. He told them to "run, jump and make noise, just do not sin!" He did not believe in punishing the boys for their ignorance but rather used a method of discipline called "the preventive system". Essentially, this system kept the boys from sin by spending time with them regularly and keeping them busy with important work. He believed that reason, religion and kindness were to be used when teaching the children. Don Bosco did not think that children should be corrected in the presence of others but that any correction should be done privately with utmost respect for the dignity of the child. He also instilled in them a love for the Sacraments and a strong devotion to Mother Mary to keep them on the right path. Don Bosco believed that recreation was important for everyone, but especially the young people. He felt that by spending time in recreation each day with the children, he gained their trust and admiration, making catechizing them a much more simple task. He played games, taught them to read and write and taught them about God. Saint John Bosco spent his life plagued by very upsetting dreams. He dreamt often about the state of his boys' souls and the reality of sin. He was a great confessor. People came from miles and miles around to talk with him, tell their confessions and pray with him. "Give me souls, keep the rest!" he often prayed. He enlisted the help of some of the older boys and several priests to start a community of religious whom he would come to call "The Salesians" after his favorite saint, St. Francis de Sales, another gentle and kind man. One of the boys, Dominic Savio, went on to become a saint shortly thereafter. Under Saint John Bosco's guidance, a group of women led by Mary Mazarello became sisters and their official name was the Daughters of Mary, Help of Christians. Years later, Sister Mary Mazarello was declared a saint. Don Bosco realized that his Salesians could reach farther out into the world and help those people who did not know God. 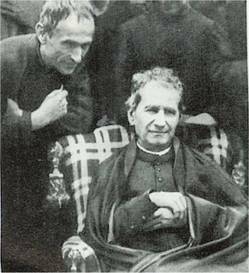 When Don Bosco died on January 31, 1888, the Salesians lived in seven countries with 1,000 members. Today there are 34,000 Salesian sisters and brothers in 85 countries along with 30,000 Salesian lay people who have dedicated their lives to helping children and young people. Don Bosco was canonized in 1934. Some of you have asked what our family does when Advent is longer than this year's. There are more days of the Advent devotions that I had hoped to post but I think they will have to wait until next year. Also, there are Christmas devotions for use with the Advent log for the Twelve Days of Christmas but they will have to wait as well. Light your Christmas Candle and enjoy the beauty of its light. Retell your favorite version of the Christmas Gospel (Luke 2:1-20). Offer your prayers as a family. Sing Happy Birthday to Baby Jesus and enjoy His cake! SING SING SING :) your favorite Christmas carols! 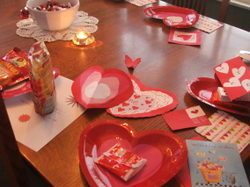 These devotions are adapted from the book Celebrate While We Wait by Schroeder. How do you feel when it rains outside? How would you feel if it rained and rained for more than a month? What if you could not go outside because of the rain? How would you know the sun was still shining above the rain clouds? One man who knew these feelings first hand was Noah. Read the story in Genesis 6:11-22;7:17-24; and 8:6-19. Noah and his family understood waiting didn't they? They were able to wait because they trusted God. They trusted His promise to save them. They believed God was in charge and knew what He was doing. They were sure of God's love for them. They knew He would keep His word. And He did. God is faithful to His people. He keeps His promises. As Noah discovered, God is certainly worth waiting for! Prayer: Thank you God for being faithful to Noah. Thank You for being faithful to us. Help us always to trust Your promises. Give us the patience to wait for Your blessings. In Jesus' name, Amen. Sing any Noah songs that your children may know. In addition: Read Noah's Ark by Peter Spier or another favorite version. Israel's story is much longer than Noah's story. Noah and his family had to wait through 40 days of rain. Moses and the children of Israel had to wait through 40 years in the desert before God kept a special promise He made to them. Do you remember the story of how Moses helped the Israelites escape from Egypt where they had been slaves for 400 years? Remember how they made it to safety by crossing the Red Sea, while God held back the water? (Exodus 13:17-14:31). God wanted to give the people a new country to live in. But once the people were on their way to the new land, they began to complain and to doubt God and His promises. Because they broke their promises to trust God, He delayed His promise. He made them wait 40 years before He led them into their Promised Land. Did God abandon His people for those 40 years? No he did not. God loved His people and took care of them. When the people could not find water to drink, God gave Moses the power to work miracles and produce water. When the people were hungry, God sent them miracle food (manna) to eat. The Israelites were not very good at waiting but God was. When the 40 years were done, God led the people safely into their new country, just as He promised. They discovered that God was worth waiting for. Prayer: God, thank You for being faithful to Moses and the Israelites. Thank You for being faithful to us. Help us always to trust Your promises. Give us the patience to wait for Your blessings. In Jesus' name, Amen. Practice a Christmas carol of your choosing. Finally, it was just the right time for God to keep His promise! After all those thousands of years of waiting, God decided it was the right time to keep His most special promise. He sent an angel to earth to announce that the Messiah, the Promised Savior, would be born. The angel came to a young woman named Mary. She was the one God had chosen to be the mother of Jesus. Read what the angel said in Luke 1:26-35. Talk about what it means to be "full of grace". What great news that was! Can you imagine how Mary must have felt? Even Mary had to wait, not 40 days like Noah, not 40 years like Moses, but 40 weeks like your own mother when she waited for you to be born. Mary had to wait to give birth to Jesus, but in the meantime she rushed off to visit her cousin Elizabeth. Read Mary's happy song in Luke 1:46-55. Notice especially, the last line. Mary was able to to wait because she trusted God. She knew He would keep His word. She was sure of His great love and mercy. Are you? Prayer: God, thank You for being faithful to Mary. Thank You for being faithful to us. Help us always to trust Your promises. Give us the patience to wait for Your blessings. Help us to celebrate while we wait. Amen. When Mary's 40 weeks of waiting were finished, Jesus was born, just as God had promised. Jesus lived His life on earth, died for our sin, rose again in victory and returned to His father in heaven. That all happened hundreds of years ago. So Jesus has already come and gone. And yet. during all these days of Advent, we have been praying "Come Lord Jesus, Come. " Do you know why that is? We know that Jesus won't be born again as a baby on Christmas Day. We know Christmas is the celebration of His long-ago birthday. But there are other ways Jesus will come again on Christmas. One of the ways that Jesus come to us now is by His Spirit. Before He died, He promised His disciples that He would send His Spirit to comfort them and help them remember and understand His teachings, to keep them in faith and to give them power for sharing the Good News of the forgiveness of sins. After Jesus rose from the dead and went to heave, disciples waited and worried. Then, sure enough, Jesus did send His Spirit to the disciples, just as He had promised. That same Holy Spirit is with us now. It is the Holy Spirit who works faith in us, who teaches us the meaning of God's love and forgiveness. It is the Holy Spirit who keeps Jesus' promise "I am with you always, even to the end of the age." Prayer: Come Lord Jesus, Come. Come by Your Spirit to live in us all. Fill our lives with Your love. Give us the power to share your Good News. Amen. Review symbols for the Holy Spirit, wind and fire (Acts 2:1-4) and dove (John 1:29-34). Discuss how these symbols will be evident at Christmas time (wintry winds, candles, fireplace, tree ornaments, Christmas cards, etc.) Discuss how these symbols can help remind you that Jesus comes to us today by His Spirit. Jesus comes to us today, on Christmas and forever through His Word. Whenever we read and study the Bible, hear God's Word taught at Mass, speak it to one another and share the Good New (like right now) Jesus is right here with us. Before He died, Jesus told His disciples, "If a man loves Me, he will keep My word, and My Father will love him and We will come to him and make Our home with him." (John 14:23). That is a wonderful promise isn't it? And we know God keeps His promises. God keeps His Word. Prayer: Come Lord Jesus, Come. Come to us through Your Word and make Your home with us. Help us to treasure Your Word and share the Good News of our salvation. Amen. Make Thee a bed, soft, undefiled. Here we are still waiting for Christmas, waiting to celebrate Jesus' coming long ago and waiting for Jesus to come today. Review the sacraments of Baptism and Eucharist. Talk about how what we see (water) (bread and wine)is not necessarily what is there(brand new white soul washed clean) (Body and Blood of Jesus). Do you wonder how we know that the action we don't see is really happening? How do we know that by His Spirit, Jesus is really coming to us in the sacraments? We simply have to take His Word for it. We simply go on trusting that God always will be as He always has been, the God who keeps His promises and blesses His people with His love. Prayer: Come Lord Jesus, come. Come to us through Your Sacraments. Give us the faith to believe Your words of promise and trust in Your forgiveness. Thank you for claiming us and keeping us in Your family. Amen. Do you know of one more way that Jesus comes to us today, on Christmas, and every day? Do you know what it is? You are it! And so am I. Jesus comes to us through people. People read and study and teach His Holy Word. It is people who are baptized and share in His Eucharist. It is people through whom Jesus comes to us today. That's one reason we send Christmas cards and give each other gifts. When we do that for someone, it is like sending a card or gift to Jesus living in them. One last thought--do you ever have to wait for someone in your family? If you remember that Jesus is coming to you through people, would it make waiting easier? Would that person be worth waiting for? Prayer: Come, Lord Jesus, Come. Come to us in people. Teach us to recognize You in people. Help us love each other as we would love You. Help us receive each other's love as a gift from You. Amen. Make some people ornaments if you did not do so on the second day of Advent. Hurray! Tomorrow is the day! After all this waiting, Christmas is almost here. Soon we'll be giving and opening gifts, singing those favorite carols and enjoying special treats. Our waiting is almost over! Or is it? When Christmas is said and done, will there be anything else to wait for? The answer of course is yes! We have another special promise from God for which we wait. It is a promise Jesus made before He returned to His Father in heaven. Jesus promised, "I go to prepare a place for you...I will come again and will take you to Myself, that where I am you may be also" (John 14:2-3). That's quite a promise. A promise of eternal life. It's a promise of glory and joy far beyond anything we can imagine. St. John wrote a whole book just trying to describe a vision he had seen of what the return of Jesus would be like. Jesus Himself also talked about returning to Earth with power and glory. And then He explained, " The King will say, 'Come, O blessed of My Father, inherit the kingdom prepared for you from the foundation of the world.'" (Matthew 25:34). Imagine that! We think we've been waiting a long time--God's been waiting for us since the beginning of the world! And one of these days He'll come back--the King of kings, the Lord of lords, the Ruler of heaven and earth, in great beauty, splendor and power--and simply say, "Come home." Now that's worth waiting for, isn't it? Have you stopped by Tracy's blog? She has some lovely Advent traditions including her family's rendition of the Advent log. I really like the forest green candles and the pine boughs. It is so exciting for me to see how everyone makes them unique and special for their own families! For those of you who will be following the Advent devotions for Week Two starting tomorrow, you will want to make your symbol cookies today or tomorrow before tomorrow's devotion time (we do ours in the evening). You can use any recipe for roll out dough, even store-bought sugar cookie dough if you are in a pinch. Here is the recipe and patterns that we use. I also want to mention that Rycraft has cookie presses of the lamb, star of David and sun that could be used year after year. Do you see this beautiful couple? The woman is holding a little, dark curly haired baby girl...their godchild. That baby is my little Mary Kathryn (who is no longer dark or curly)! How have a kept a blog for all these months and not introduced you to my dear friends Barbara and Blair? I am most horrified that I have not done so until now. 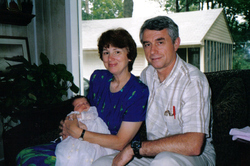 Barbara and I met ten years ago when my oldest son was only a few weeks old. She was a La Leche League leader at one of the meetings I attended as a new mother. I did not know much about being a mother except the very little I had read in a few mainstream books (that I will not link). I had never changed a diaper before I changed my son's on the day I brought him home from the hospital. I was an only child who had never babysat an infant. In fact, I had only held one baby in my life (and only for ten minutes) before holding my firstborn son. I had many questions about the ins and outs of motherhood, both from a practical standpoint as well as an emotional one. I began to see much in Barbara that I wanted to emulate as a mother. She was soft spoken, patient to a fault and always had something good to say about people. I was impulsive, rambled incessantly about anything and everything and was very impatient with myself and others. I watched her and began to imitate the things that I loved about her. I spent a couple of months attending those La Leche League meetings, learning how to mother my baby and not just provide nourishment for him. Barbara invited me to her home one day for tea. I met her children and was taken aback. Here were kind, smart and friendly children! Seven of them! They were homeschooled, which I had never heard of before. Yes, she taught them herself. She also, horror of horrors :), did not own a television...hadn't had one in many years. What did they do for fun? Why they played and acted out stories they had read in books. They drew and sang and played instruments. 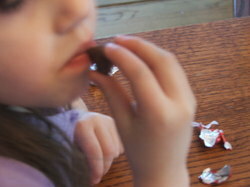 They did what children will do when given large amounts of time with which to work. There was something else about that family that was special. I could not put my finger on what it was until Benjamin was almost a year old and Barb and I both volunteered to worked at an organic cooperative farm each Thursday. It was almost an hour away. Once Barb learned that I was planning to buy a farmshare and work on the same day that she was, she offered to drive the baby and I in her van. Benjamin and I rode in her big van with all those children. When they would drive down the highway, they would sing or read aloud to one another. But before anything else, they would pray some prayers for safe travel...Hail Marys and Our Fathers and other prayers that (somewhere in the recesses of my Evangelical Protestant mind) I remembered from my childhood as a Catholic. I prayed along, happy to remember the words I had uttered as a child with my mother by my bedside. After much tea and many visits to her home, I returned to the Church I had forsaken years earlier. The reason I returned was primarily because of the prayers and steadfast example of love offered to me from Barbara. She and Blair answered my questions and patiently undid the false ideas I had about Catholicism. My son was baptized just before his second birthday. She introduced me to beautiful literature and beautiful illustrations, lent me books like Honey for a Child's Heart and For the Children's Sake. I researched Charlotte Mason, mainly due to that last book. I learned the importance of surrounding my children with beauty and goodness. Also, my desire grew to provide a new and exciting learning environment for them. So many areas of my life are richer having met Barbara. Had I not met her, I would not parent the way that I do. I would not feel comfortable bringing that baby into bed to snuggle with me. I would never have dreamt of homeschooling. Do you know that the first time I saw an Advent log was over Blair and Barb's house? Hers was the inspiration for mine. I thank God, for so many reasons, that our paths crossed when they did. 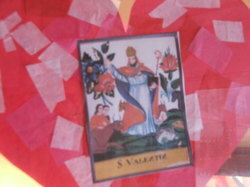 St. Martin of Tours (397), was born in Pannonia (modern Hungary) of pagan parents around the year 316. Having become a soldier at age fifteen, he later gave up military life and was baptized. Sooon after he founded a monastery at Liguge in France, where he led a monastic life under the direction of St. Hilary. He was ordained a priest and chosen bishop of Tours. He provided an example of the ideal good pastor, founding other monasteries, educating the clergy, and preaching the Gospel to the poor. He is the patron of soldiers and the uncle of Ireland's St. Patrick. In Poland, rich cookies are shaped like horseshoes to remember St. Martin's snow-white horse, on which he "comes riding through the snow" when one least expects him. St. Martin horseshoe cookie recipe can be found at Heart of the Kitchen.